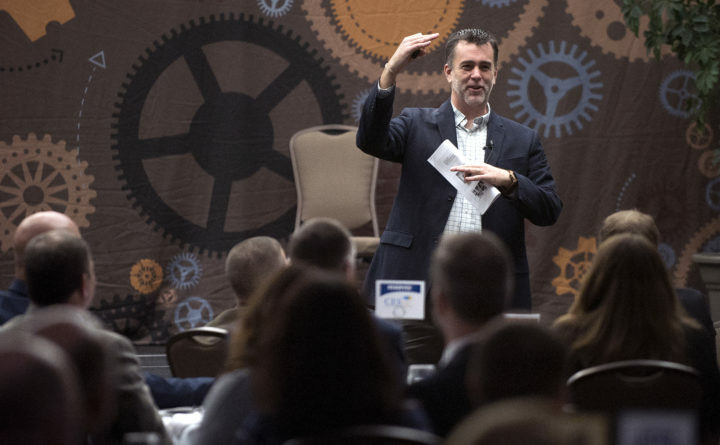 Sean DeWitt, president of Our Katahdin, delivers the keynote speech at the Bangor Region Chamber of Commerce’s annual business breakfast at the Cross Insurance Center in Bangor on Jan. 9, 2019. A volunteer economic development group that’s trying to revive Millinocket’s former paper mill site is continuing to challenge a federal tax lien that has hampered its efforts. The lien most recently dissuaded a North Carolina forest products company from launching a $30 million factory on the site. The group, Our Katahdin, filed a third appeal of the $1.4 million tax lien with the Internal Revenue Service last Friday — although the ongoing federal government shutdown will delay the IRS’ consideration of that appeal. Our Katahdin is also seeking a new, more accurate appraisal of the mill site’s property value and looking at other options for getting rid of the tax lien, which the group inherited two years ago when it bought the 1,400-acre site for $1. The previous owner of the mill, Cate Street Capital LLC, had created two subsidiary organizations that owed $1.4 million to the IRS. Until that lien is resolved, the organization won’t be able to spend a much larger amount of funding — about $8.76 million — that it has lined up for improvements to the mill site, the group’s president’s, Sean DeWitt, said Wednesday morning. DeWitt, a Millinocket native, was the keynote speaker at the breakfast, held at the Cross Insurance Center. 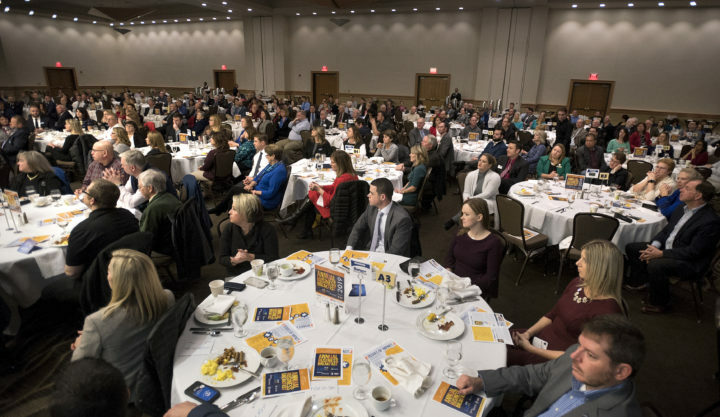 People attend the Bangor Region Chamber of Commerce’s annual business breakfast at the Cross Insurance Center in Bangor on Jan. 9, 2019. Along with discussing the tax lien, he described other efforts Our Katahdin has made to bring economic activity to a region battered by the closure of paper mills, including the creation of a co-working space, the pursuit of better broadband internet service and the wooing of companies in industries ranging from data storage to aquaculture. DeWitt normally works in Washington, D.C., as a director at the World Resources Institute, an organization that researches the economic potential of natural resources, but he travels to Maine for his work with Our Katahdin. During his talk on Wednesday, he mentioned that he has multiple family members who worked at the Great Northern Paper Co. Mill that once employed thousands of people. To help redevelop the mill site, Our Katahdin has secured multiple types of funding totaling more than $8 million to improve the roads and other infrastructure and convert the area into an industrial park, according to DeWitt. 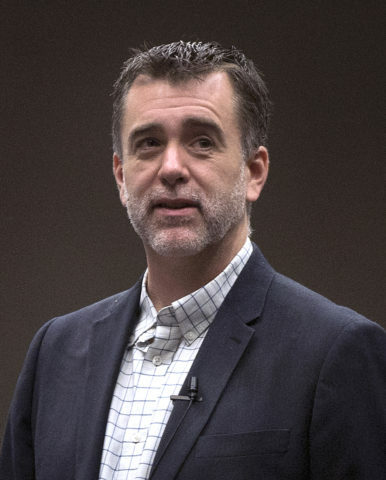 Those funds include $5.3 million from the U.S. Economic Development Administration and lesser amounts from the Maine Rural Development Authority and from a New Market Tax Credit arrangement it’s working out with the Northern Forest Center, DeWitt said after his talk on Wednesday. However, all that funding will only be released on the condition that Our Katahdin eliminate the $1.4 million tax lien from the Internal Revenue Service, which it so far has been unable to do, DeWitt said. That’s already spiked one large investment at the site. LignaTerra Global LLC of Charlotte, North Carolina, was considering opening a $30 million factory at the Millinocket mill site that would manufacture a composite wood product for use in construction and cross-laminated timber, and employ more than 100 people. But late last year, the group decided against launching the project in Millinocket because of the lien. Now, Our Katahdin is doubling down on its efforts to convince the IRS to remove the lien. Two of its appeals have been rejected, but it filed a third one at the end of last week. The group disagrees with the IRS’ reasons for rejecting its appeals. It argues that the federal agency’s accounting doesn’t reflect how the value of the mill property has changed over the last 10 years, among other things. To that end, the group is now having an appraiser come assess the current value of the property, DeWitt said. However, he said that the IRS employee who should have received the new appeal last Friday isn’t working because of the federal shutdown. Our Katahdin is also looking at several other options for wiping out the tax lien. It has unsuccessfully requested that the IRS forgive a portion of its debts through a process known as Effective Tax Administration. The group is also considering how it may be able to pay back the $1.4 million debt, whether by borrowing money up front or securing philanthropic donations.